We love the South Shore of the Island for its awesome beaches, gorgeous red cliffs, and rolling pastoral countryside. We soak up the opportunities to hike and bike some of the most wicked trails in the province. But—as chowhounds—we also love the burgeoning food and drink scene brewing all around us. Folks who visit always ask us for local options for eating out, and our list is long. 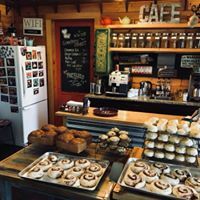 First off are our friends up the road in Augustine Cove at the By the Roadside Gallery and Café, one of the most eclectic dining spots on the Island. Cathy and Bill have created a café alongside their glorious art gallery. They serve up some of the best seafood chowder on PEI, great organic coffee, and our favourite brunch item, the famous Skillet. It’s a down home kind of place where you can eat like a local, browse for pottery and wood carvings from local artists, and set yourself up on Island time. Tasty treats are made fresh from scratch at By the Roadside Gallery & Cafe. A few minutes away up the road in Albany is The Handpie Company, purveyors of fabulous savoury pies, both meat and vegetarian. Think Acadian tourtiere or steaming cheesy potato pies, with perfectly flaked crusts. The perfect road food. The Handpie Company serves up savoury, steaming pies...the perfect road food. Five minutes from The Hideout is the artsy village of Victoria-by-the-Sea. Step out for a night of theatre and an afternoon of browsing bookstores, artisan galleries, and hyper-local shops. While you’re at it, pop in to our friends at Island Chocolates, PEI’s oldest and best-loved chocolate shop. The Gilbert family are renowned far and wide for their innovative, ethically-sourced, handmade chocolates. For a full meal, grab a lobster roll and try one of the rotating tap of local microbrews at The Lobster Barn Pub, all while watching the fishermen haul in the day’s catch from the cozy patio. Speaking of microbrews, Barnone Brewery is just up the road from us in scenic Rose Valley. Stop by to try their Sessions Ale—perfect for summer sipping—and check out growler night on Thursdays, when the brewery opens for free live entertainment, food truck wood-fired pizza, and bocce ball onsite. All this and more, within a ten-minute drive of The Hideout! If you’re visiting us this fall, be sure to check out PEI’s Fall Flavours festival. Think intimate food tastings, multi-course meals with celebrity chefs, local feasts—including the celebrated Savour Victoria event, right in our hood. If you’re curious to visit wineries, cheese shops, oyster bars, and farmers’ markets further afield, let us be your guides to drinking and dining on the Island.